Christmas is now just around the corner and the final touches are being made to the 2015 Unit Costs of Health and Social Care report – scheduled to be published online on 14th December. Time to sit back and watch PSSRU’s technical experts do the rest, reflect on another unit costs year and, before putting up my Christmas tree, open a folder for 2016. A busy year as always, and here, in this blog, the opportunity to reveal a couple of my highlights and tell you more about the 2015 edition. Two high points stand out this year. 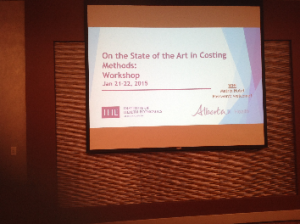 The first was a trip to Edmonton, Canada to present at a workshop on ‘the State of the Art in Costing Methods’. Although there has been some international interest in the report in the past, this invitation served to reinforce the growing interest in our work and, I believe, was also partly testam ent to the power of social media, the invitation coinciding very closely with my ‘Twitter, blogging & the Unit Costs Report’ post being tweeted to foreign parts. 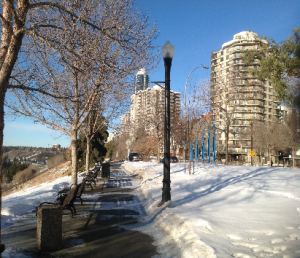 So, in January, packed with my winter woollies, I set off to meet with the Institute of Health Economics and other invited European representatives – an interesting experience with the sun coming out and temperatures soaring to 8 degrees to melt the snow! The second opportunity which presented itself was described in a blog by my colleague Amanda Burns; the invitation to work with Voltage TV productions on a Channel 4 programme ‘NHS: £2 Billion a Week & Counting’ highlighting how much services cost the NHS. With the estimated number of readers reaching 11,000 this year and the volumes cited in 65% of English health and social care economic evaluations, more than ever we are grateful to readers for alerting us to new information sources. The need to halt the ‘Yellow pages’ effect described last year has however become more pressing! So this year, we have introduced some promised changes to a couple of the sections which has not only condensed two of the chapters, but has also had the bonus of allowing us to provide grades of professionals. These tables will also be added to our website in excel format to accommodate requests from users. Although the quantity of new information has meant that the report still contains over 300 pages, we hope that readers are happy with this new format; next year, we will continue to tweak and improve the presentation. It’s now time now to give you a glimpse of our 2015 volume. First we are delighted, following the historic piece of legislation announced this year, that PSSRU’s Stephen Allan has written a topical guest editorial about the Care Act 2014. The clear summary he provides assesses the potential impacts for social care markets. Three short articles follow: Raphael Wittenberg and colleagues discuss the development of a new survey tool to gather self-reported data about respondents’ care needs, use of formal care, and their use and provision of informal care; and Kate Baxter and Parvaneh Rabiee from the Social Policy Research Unit at York University identify the costs of vision rehabilitation services in England. These are rarely studied but with the number of older people in England set to rise, they are an important addition to the unit costs work. Our final article has been provided by Colin Ridyard and Dyfrig Hughes from the University of Bangor who discuss their review of resource-use questionnaires used in trial-based economic evaluations. We have added several new service costs for: acute medical units, level 3 rehabilitation services for patients with complex rehabilitation needs, and GP and nurse-led triage. Also thanks to the Autism Alliance, this year we have been able to work with three of their member agencies dotted around the country, to include the costs of running residential services for people with autism and complex needs. Sometimes, this involves replacing secondary sources of information with a later year, or using an inflator, or checking that percentages applied to estimates are still valid. This year, as well as the routine updates, an important task has been to review NHS overheads, and a detailed summary on how we have approached this can be found in the Preface to the 2015 edition. Other important work also described in the Preface are: a survey of all English dental practices to supplement information collected at the Health and Social Care Information Centre; and some initial time-use information following our on-line survey in 2014/15. Against the backdrop of the 2015 Paris Climate Conference being held to encourage countries around the world to join together to halt global warming, a particularly exciting addition to our work this year has been the inclusion of initial figures for environmental costs alongside certain unit costs. Given the renewed emphasis on cutting carbon emissions, we will no doubt have plenty of contact with colleagues at the Sustainable Development Unit in the future. So before I give away far too much, you may notice that Amanda Burns, having worked on the programme for the last two years, is now second author. 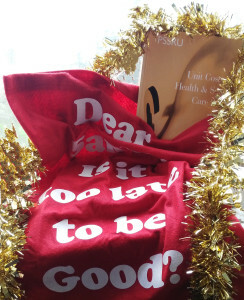 So from us, thanks to the rest of team – Merry Christmas!